Since it was first discovered, fire has been heating our caves, huts and homes. But wood-burning heat has not been without controversy in our modern world. Looking back on my childhood, I remember days filled with the smell of two-stroke exhaust and the whine of my Dad’s 20” Homelite sawing standing dead wood into stacked cord wood for next year’s winter. Environmental concerns and the negative effects on the health and wellbeing of the user have led some cities and regions to ban wood burning installations in all new home construction. Although pellet burning furnaces and airtight woodstoves have allowed diehards to continue stoking their fires at home, these methods still have limits of efficiency and impact the home’s air quality. 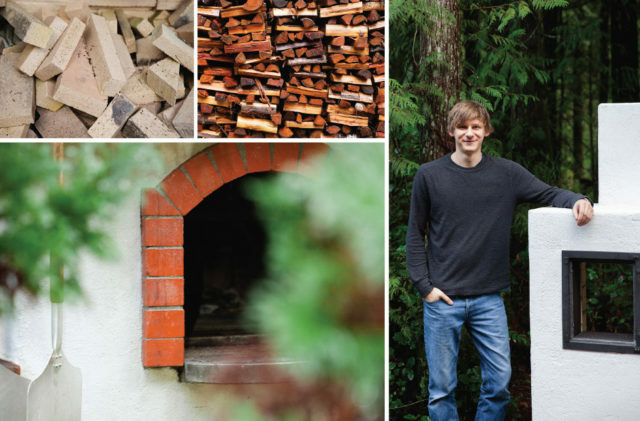 At just 26 years of age and only three years into the design, calculation, and construction of Austrian Mason Heaters, Carl Sidl has become a champion of the benefits of this proven, millennial old wood burning technology. Although relatively new in Canada and stifled regionally by outmoded building codes, this method of heating buildings is widely used throughout Europe and gaining traction in the United States. There is a certain kind of irony in having this young mason explain to me the inner workings of a device that the Ancient Romans used to heat their bath water. Essentially the heater is a sealed fire box that looks not much different than that of a standard fireplace insert. But it’s the maze of channels, sometimes 12 metres in length, that extends from the fire box that makes this way of heating your home so much more efficient than traditional methods. These channels extract and retain the heat from the fire gases and allow them to radiate heat for a prolonged period of time. 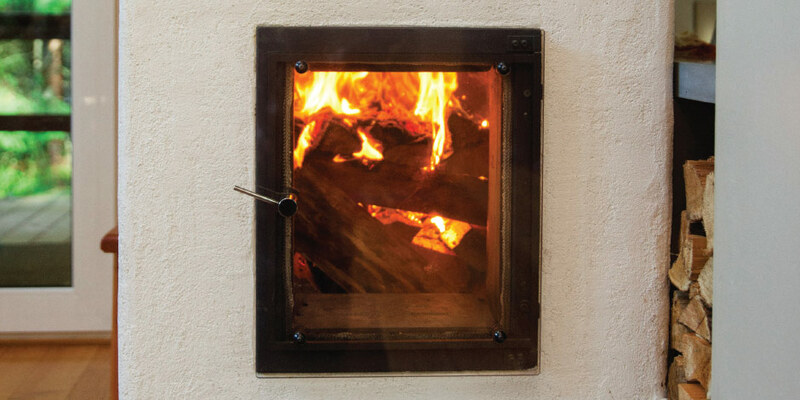 Less wood is required on a daily basis, and the way the fire is drafted minimizes smoke emissions and ensures a more efficient burn of the fuel wood. Carl explains that this type of wood burning does not heat a home the same way a cast iron wood stove does. Traditional methods of wood burning heat the air surrounding the stove or insert. Masonry heaters produce infrared waves that heat objects: the walls, furniture, and people. By doing so, the air temperature is actually cooler but the occupants stay warm. The air is not dried and this method of wood burning does not produce dust. I’m told this is why it’s the chosen method in Europe to heat not just homes, but retirement homes and daycares. After spending some time with Carl, I get the sense that his endeavour to build these efficient heating systems was a family affair and I would be remiss if I didn’t mention how Carl came to reside in the Comox Valley. In 1998, Carl’s father Stefan was working in California while his family remained in Europe, he rented a car and traveled north, eventually arriving in Comox. After tipping back a pint at the Blackfin Pub, he became enamoured with the ocean, the Beauforts, and the glacier. He made his way to a payphone and called his wife in Vienna and asked her to pack up the kids; they were moving to Vancouver Island. When I asked Carl how he got started in a trade that pre-dates the English alphabet, he told me he decided on this path while sitting at a pub in Victoria with his family. I get the sense that most of the Sidl’s major life decisions are made with hands on glasses and elbows on a bar. With sage advice from his Dad, who told him that anything worth doing is worth doing right, Carl mentored with long time masonry heating specialist Ernst Keisling in Nova Scotia and continued his training, working both in Austria and Italy. Living in the Pacific Northwest we have an abundance of sustainable fuel sources in our surrounding coastal rainforest. With recent debates over run-of-the-river hydroelectric power and pipeline projects in northern BC, perhaps looking at alternatives to modern day conventional heating and a return to wood fueled heat may not be unreasonable. But the real paradox is that a solution of a sustainable and healthier substitute for our current heating needs may lie in the hands of a 26 year-old mason and an ancient technology.